Posted on November 15, 2013 at 11:24 am. A short essay of mine over at Bella Caledonia called Unwilding Scotland attracted many intelligent responses. It’s taken me too long to reply but I thought I’d try and clarify a few things. Since I first wrote on this topic a few months ago (again at Bella) the debate seems to have acquired a renewed energy. I find this reassuring. What follows is mostly in response to Paul Webster’s comments (Paul runs the wonderful Walk Highlands website which is more or less essential browsing for anyone planning a longer walk in Scotland). Paul has a fair point when he complains that when I talk about the Uist machair, I don’t make it sufficiently clear that this doesn’t lie within any of the SNH proposed areas of ‘core wild land’. This wasn’t intentional obfuscation on my part. My experience of living in North Uist certainly informed my thinking about how much labour goes in to making Scotland’s landscapes conform more closely to the aesthetic ideals that are projected on to them. My key point is this: areas of ‘core wild land’ may not include the machair land but the hills are still very much part of the cultural hinterland of the more inhabited districts. Part of the abstracting philosophical consequence of ‘wildness’ is to separate such landscapes from the very people who have the greatest cultural claim on them. The hill land of South Uist – ‘core wild land’ for SNH – is not a place set apart, a landscape that can be meaningfully detached from the islanders on the west side. Unfortunately that, as I see it, is the rhetorical function of wildness as it being used here. Just because a place is not currently inhabited does not mean that it is some kind of tabula rasa to be reduced to its visual attributes for the passing hillwalker. There are doubtless ‘wild’ places in Scotland that are less tied into their hinterlands than is the case in South Uist. But that merely reveals that the concept of ‘wildness’ is entirely insensitive to local cultural nuance. The Uibhisteachs, to my mind, are right to be worried. They should be concerned that such a move may inhibit their ability to use the land resources that have been so hard won. There is also a wider argument to be made about the continuing failure by the state-sanctioned guardians of our natural heritage to recognise and celebrate the ways in which our natural history and cultural history are entwined. The language of wildness always tries to keep these at arm’s length. In their consultation paper, SNH say that ‘the evidence of past and contemporary uses of these areas is relatively light, and do not detract significantly from the quality of wildness’. Detract significantly? Can’t we just stop conceiving the presence of people – historic or otherwise – as some kind of loss? Why not think of human activity as being a constituent part of what makes these areas interesting and meaningful? Wildness ties us up in knots. It requires all sorts of qualifications and clarifications on the part of the conservationists: ‘yes, we know that it isn’t really wild…’; ‘light evidence of people may not be too bad …’ etc. It simply isn’t a useful term to carry a richer sense of landscape as being a hybrid labour between humans and non-humans. I don’t for a moment think that SNH want to impose the attributes of wildness on the whole of Scotland. Rather, my problem is that they want to fix ‘wildness’ (and its proxies) as being the defining aesthetic for a big portion of the Scottish landscape. It’s an aesthetic ideal that carries some hefty political baggage and has no democratic mandate in the very regions that are deemed most wild. One of the problems that besets the whole debate is that proponents of ‘wildness’ can’t see past the category itself. We need to understand wildness as itself a way of seeing rather as some external reality ‘out there’ in the hills. In other words, you can have any flavour of wildness you like as long as it’s wild. Great. There doesn’t seem much room here for the many people for whom wildness is simply not the cultural lens with which they see the Highland landscape. The argument that wildness is what brings tourists to the Highlands makes the same mistake of failing to see past the category. We must not conflate the Highland landscape with the cultural lens of wildness. Yes, ‘wildness’ is one part of how the Scottish Highlands have been iconographically represented (though the same taste for wildness didn’t always have happy consequences on the ground). But this is less an argument about what Scotland should look like and what sort of nature we might want, than it is about how we should conceive of Scotland’s landscapes. That distinction is crucial and, at the moment, it’s mostly forgotten. Posted on July 18, 2013 at 10:43 pm. Following my Against Scottish Wildness essay, I’ve been interested to see the discussion both at Bella Caledonia and on twitter, including a lively and well-mannered exchange between myself and the John Muir Trust. I have now had a chance to address the ostensible object of this debate, namely the consultation over the Scottish Government’s National Planning Framework 3, Main Issues Report. But it is important. If the SNH designation of ‘core wild land’ is formally used to inform planning consent that could have significant repercussions for the ability of local people to use the natural resources at their disposal. It is a very imprecise tool to prevent the ‘wind-cities’ that so alarm the John Muir Trust. If you want to respond to this consultation you have to do so by Tuesday 23rd July. Here is the SNH map and, further below, part of my formal response. Scottish Planning Policy already safeguards areas of wild land character. Do you agree with the Scottish Government’s proposal that we use the SNH mapping work to identify more clearly those areas which need to be protected? 2.20 SNH has been updating its wild land mapping using modern GIS tools to provide a more objective approach to understanding wild land. 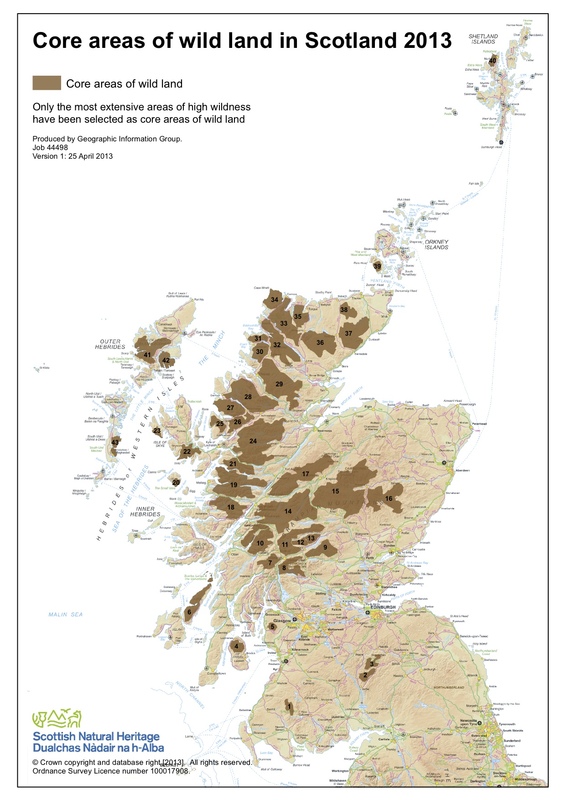 Based on a number of attributes like naturalness of the land cover, ruggedness, remoteness from roads and the visible lack of modern man-made structures, SNH has published an updated map showing the ‘core’ areas of wild land in Scotland. Most of what I want to say can be summed up thus: wildness is a human attribute that we ascribe to the landscape, not a quality that adheres in the landscape. You cannot meaningfully objectify an element of human experience though SNH’s map seems to be the product of this misconception. All of this would be an arcane academic dispute were it not that such a map has the potential to limit the ways in which local people can use their own resources. GIS is useful for many things but it would be an elementary error to say that because something is the outcome of GIS-based analysis it is then ‘objective’. My problem here is that claims to objectivity in this context are apt to conceal what is inevitably a political exercise. To designate land as ‘wild’, as this SNH mapping exercise does, is to privilege some attributes (ruggedness, remoteness etc) over others. In this way, the designation ‘wild’ brings into focus some elements of the landscape (for example scenery that conforms to a sublime aesthetic) at the expense of others (its toponymy or storyable properties; its productive potential). Unavoidably, this is a judgment about what we value and what we like; it couldn’t be otherwise. My concern is less that such judgments are made than that they are being concealed behind a veil of apparent objectivity. Any claim to objectivity in this regard is simply unfounded. To comment on the methodology (pdf here) risks obscuring my more fundamental critique of the research design and framing. But let me draw attention to some other difficulties. For such a politically sensitive task – categorising which land can have development and which not – it is surprising that the methodology does not appear to have been subject to peer review. Claims to rigour would be more credible if it had been scrutinised by academic referees for a journal like Landscape Research or Scottish Geographical Journal. I can find no explanation or justification as to why these four attributes (perceived naturalness; ruggedness; remoteness; lack of visible development), and not others, were selected. What counts as ‘wild’ – and thus what can be used a proxy indicator of ‘wildness’ – is inherently subjective, though this sort nuance is lost amid much bluster about the ‘robust approach’. Imagine if SNH had used evidence of placenames from the six-inch Ordnance Survey maps from the 19th century, newly digitized by the National Library of Scotland. A very different picture of Scotland would emerge of an intimately known, named and storied landscape that runs quite against the grain of its apparent ‘wildness’. Plainly any model or analysis is only as good as the judgements that go into it. GIS itself confers no rigour or authority; it simply calculates whatever variables are set. Much of the important evidence for human-environment relations – the oral tradition, for example – does not come in any form that is commensurate with GIS analysis. If you exclude many traces of human engagement from the outset, as is mostly the case here, then, yes, you will find the ‘wildness’ you seek. The problem then however is that wildness then becomes a product of SNH’s own epistemology. The use by SNH of the ‘perceived naturalness’ of land made me wonder ‘perceived by whom’? The answer of course is by an ecologist via satellite-derived LCM2000 data. It would be hard to find a more apt metaphor for this attempt to define wild land than the claim that from Lower Earth Orbit it looks pretty natural. None of the many stakeholders here are in genuine doubt about the extent of human intervention in our uplands, or that much of this land, even that classified 5, is overgrazed. I have a particular concern about the criteria ‘Lack of Built Human Artefacts’. I need not dwell on the inevitable anomalies of categorization in this quantitative approach (like the fact that forestry plantations don’t count as a human artefact). But the idea of privileging the visible in the search for the wild is itself part of the long history of Romantic conceptions of wilderness. Indeed, this is the crux of the problem: the evaluation of landscape based strictly on a narrow set of aesethetic criteria will always obscure the many ways in which people have inhabited and shaped these landscapes. In the end, all these methodological criticisms are rather beside the point. It is not that I think that SNH could just refine this methodology and produce a better map of ‘core wild land’. The undertaking is itself flawed. The map of ‘core wild land’ assumed from the outset an a priori ‘wildness’ that is separate from the social world. In so doing, it shoulders a great deal of cultural and philosophical baggage that might still have currency in John Muir’s America, but is no longer helpful in thinking about the future of a Scottish landscape that is, and always will be, resolutely cultural. In writing this, I should point out that I am not some libertarian advocate of development; I am also broadly supportive of a national planning strategy. But the Scottish Government should be aware that for many communities as well as those in environmental activism and academia, the term ‘wild’ is no longer sufficient. This is not just about how we manage the landscape. It is about how we conceive of the landscape. Our conservation charities and NGOs, hunkered down in their traditional defence of an apparently ‘wild’ Scotland, have missed an opportunity to re-think what the Scottish landscape could yet become. The Cartesian provenance of ‘wild’ will always pit people against the environment. Our planning needs a new vocabulary that is not ashamed that our nature and our culture are, and always have been, so thoroughly intertwined.